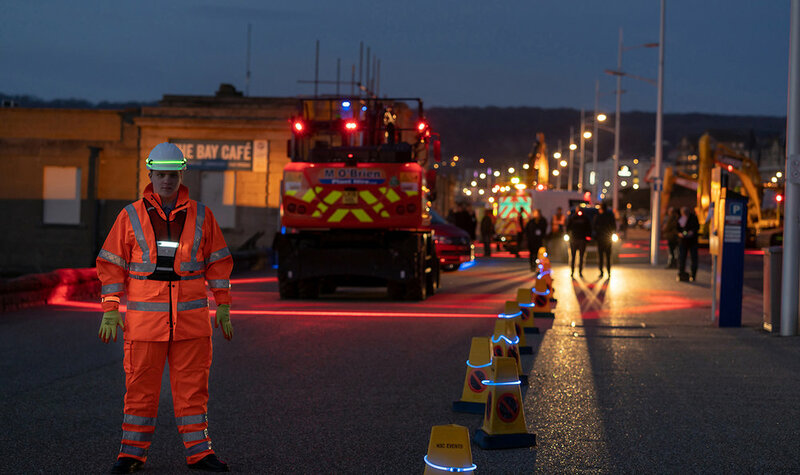 The latest developments in illuminated safety solutions were showcased in a high-profile event at Weston-Super-Mare seafront last month (13 February). The event, which was hosted by FHOSS Illuminated Safety Solutions with support from the AA, attracted some of the UK’s biggest construction, plant and fleet hire companies. As well as representatives from the construction and plant hire world including Plantforce, L Lynch, Flannery and M O’ Brien, delegates from Highways England and DFT (Department for Transport) were in attendance to view FHOSS Illuminated livery in action and to test its effectiveness within a real road scenario. “We needed a stretch of road on which we could measure the effectiveness of our product as well as being able to gather as much information and feedback from both members of the public as well as leading government and industry experts.” - said Andrew Kimitri, Director of FHOSS Illuminated Safety Solutions. “This particular stretch of road was perfect for us due to the straight approach run to it, as well as the fact that we were able to switch off the streetlights to demonstrate the effectiveness of our products in total darkness”. The product trial began as the sun started to set. This was to measure its effectiveness in twilight, partial darkness and total darkness. Attendees of the event were driven towards the test vehicles a number of times and observations were recorded to measure feedback and effectiveness. The AA, who are currently trialing the product, provided two vehicles for the event; one fitted with FHOSS Illuminated livery and the other without. Fhoss was also showcasing another one of its products, the FHOSS Halo Exclusion Zone. This system casts beams of light on the area surrounding plant machinery creating a virtual “danger zone” which has the effect of alerting workers to the hazard and encouraging them to stay at a safe distance. The trial was particularly successful as we witnessed people subconsciously avoiding the area marked out by the Halo Exclusion Zone. “It’s looks very dramatic in darkness”, said Craig Flowers of Aggregate Industries. “When plant machinery is working at night, there is very little light to reflect back from standard prismatic material. This is where companies really benefit from FHOSS innovation as it does not require a secondary light source”. Weston College also supported the event, Dr Paul Phillips CBE Principal and Chief Executive commented; “We were delighted to offer our support to this local company who are leading the way with this type of technology. It also aligns nicely with our brand new facility the Construction Training Centre specialising in plant operations, scaffolding, groundwork and logistics. Cllr Elfan Ap Rees, Deputy Leader of North Somerset Council said:­­ “We are proud FHOSS are producing truly innovative safety products in North Somerset. I am glad that we were able to work with them to create this opportunity to showcase their product portfolio to such high calibre industry representatives and I wish them every success as their company continues to thrive." For FHOSS Illuminated Safety Solutions, there’s no doubt the future is looking bright!